Ethnic foods – all kinds, really – are my favorites. I have a particular soft spot for Lebanese and Mediterranean cooking. Growing up, family friends attended a Lebanese church that held several events every year to raise money for the community. I spent nights each year, all gussied up, eating more kibbee & hummus than you can shake a stick at – only to work it all off doing line dancing versions of, looking back on it, seem a little like "the forbidden dance". Of all of the dishes I’ve tried, tabbouleh was my least favorite. Something about the bulgar or cracked wheat just didn’t do it for me, although the mix of fresh herbs kept bringing me back to try it again. 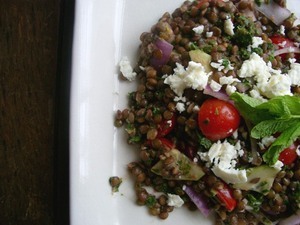 I’ve revisited this dish using one of my favorite ingredients – green lentils. Tossed with the herbs and tangy dressing, the lentils soak up all of the flavor and make this salad incredible hearty without sacrificing the lightness. – Cook lentils, covered, in 1 1/2 cups water or vegetable stock. Simmer until tender and most of the liquid has been absorbed, about 25 to 30 minutes. Drain and transfer to a bowl. – Mince herbs in a food processor and add to lentils and chopped raw vegetables. Top with dressing, toss together, and allow to sit for 15 minutes so the flavors can marinate. My mom loves Tabbouleh,I have never developed the taste for it. tabbouleh was one of the first things i ever made. you’ve just convinced me to think about making it again.